The Microsoft Dynamics Lifecycle Services team is happy to announce the immediate availability of the January release of Lifecycle Services. We have learned that in many cases, customers and partners have only been applying platform binary updates and are getting into an unknown state because critical application binary updates are missing. We recommend that you always select the Application Binary Updates tile because it includes the cumulative platform binary updates. Based on what we have learned from customers and partners, we have combined the tiles, Application Binary Updates and Platform Binary Updates into a single tile called All Binary Updates on the Environment details page. This tile is still a cumulative update and shows the KBs applicable to your environment based on the environment version. 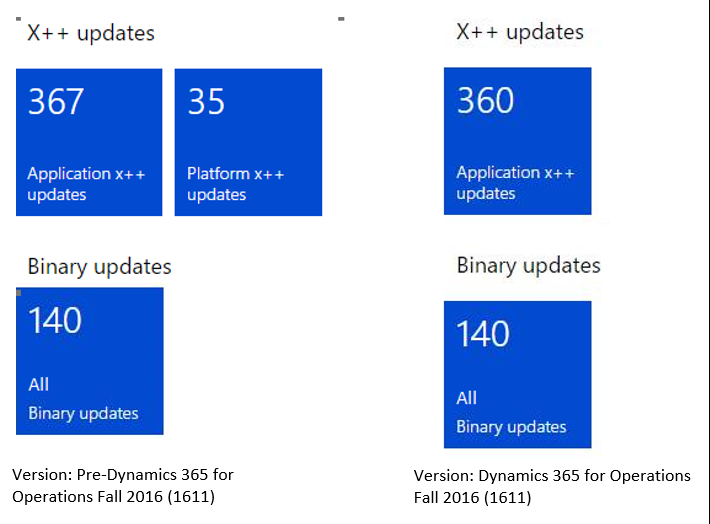 Because platform models can’t be over-layered in the Dynamics 365 for Operations 1611 release, the Platform X++ Updates tile is no longer required as all updates are binary updates from this release onwards. For customers that are on versions prior to Dynamics 365 for Operations 1611 release, they will continue to see the Platform X++ Updates tile as they might have customizations to the Platform models. Optimize package application time: We have reduced the time required to apply an update in Sandbox and Production environments. On a multi-box environment, package application times have been reduced by about 50%. This should significantly lower the downtime required in Production environments. Improvements to package application UI: Except for the Production environment, all environments now show a progress bar that is similar to the progress bar in Production environments. This bar indicates the progress of a package application. There is also a grid that shows steps that are currently executing and steps that have failed. This enables customers and partners to get the information they need for troubleshooting. For example, if a step is taking longer than usual, the grid will show the step times. If the step fails, the grid will have information and additional details about the failed step. Note that there is no change in the package application UI on a Production environment. Improved experience when package applications fail: Previously, there was no option to recover when a package application failed outside of the actual execution of the steps. There is now a button, Resume,  that will become available when an environment enters the failed state because of a package application failure. This will only be visible for customers and partners in a non-Production environment. This is because in a Production environment, the package application is completed by the Service Engineering team. With this change we have removed the Rerun step and Retry options. When a package application fails, click Resume and the location and timing (whether it was before servicing started or during a step) of the failure will be detected, and will be addressed automatically without requiring customers or partners to make the call. In July 2016, we added functionality to apply updates in the form of packages to an environment. At that time however, flows were enabled only for Demo, Standard Acceptance Test, and Production Topologies. With the January 2017 release of LCS, we have enabled these flows on the Dev/Test topology. This means that on a dev/test topology, you don’t need to apply updates using the manual process of generating a runbook and then executing the runbook. Instead, on the Environment details page, you can go to Maintain > Apply Updates. Select the package that you want to apply, and then click Apply. This will start the package application on the environment. Just like other topologies, all relevant stakeholders will receive email notifications on the progress of the package application and can download the logs and runbook for troubleshooting any issues. Today on the Dynamics 365 Home Page you can view all of the Dynamics 365 for Operation environments that have been pinned to the dashboard. The Configuration and Data Manager now allows data package and user-defined keyword association. Keywords allow data packages to be grouped into work streams or categories. After keywords are assigned, you can filter the Configuration and Data Manager grid to show only data packages that are associated with a particular keyword. You can also filter by data package name. To assign a keyword to a data package, select the data package(s) and click Add keyword. Enter keywords and click OK. The keywords will appear in the grid. Use the Filter text box to filter the view by keyword or data package name. 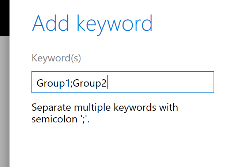 You can delete keywords by selecting the keyword(s) in the Package details pane and then clicking Delete keyword(s). With the January release of LCS, Dynamics 365 Support has been added to the Dynamics 365 Translation Service. Important: LCS and Dynamics 365 Translation Service may refer to Microsoft Dynamics CRM, which is now called Microsoft Dynamics 365. In the January release of LCS, there are known issues in Microsoft Dynamics 365 Translation Service. The Translation Service currently does not support situations where the translation request source and target languages belong to the same parent culture. For example, French – France to French – Canada. There is no workaround for this issue. For Microsoft Dynamics 365, translation results to English from Bulgarian, Thai, and Ukrainian are based on the generic machine translation system rather than a product-trained system. There is no workaround for this issue. For Microsoft Dynamics 365, translation requests to English for legacy material is not supported from Bulgarian, Thai, or Ukrainian unless the legacy files contain more than 10,000 sentence pairs. There is no workaround for this issue.